The original 12 volt generator was shot. There was an 'open' in the windings. I was quoted 850+ dollars to repair it. AND when fixed, it would put out a whopping 27 amps! Trying to get the engine and chassis to run, I had other places to spend money on. I put the "dud" generator on to simply be an idler for the timing chain and turn the second distributor. I got a "one wire" GM type alternator and installed that. It worked perfect, but the sight of it always bothered me- I was wanting something else. Something better. I had seen the "genernator" units that fit flathead ford engines. 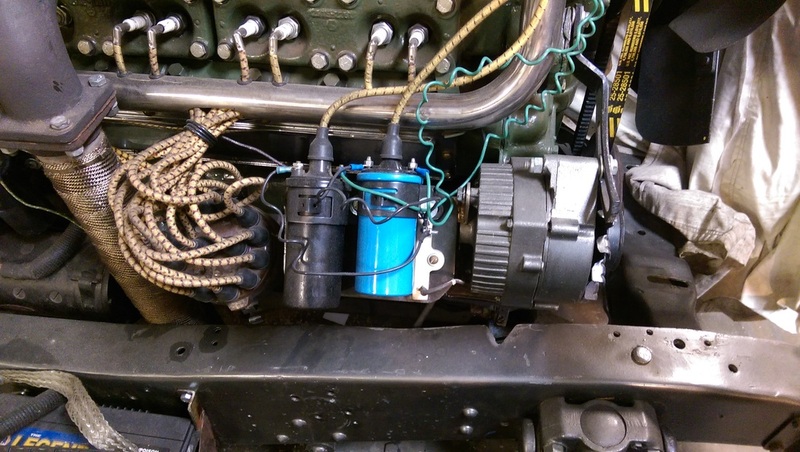 They are the same size physically as the stock generators, but have a 12 volt alternator and regulator built in. They cost around 450 dollars. So, of course, that means I have to do this myself. Photo of the 1 wire GM alternator hanging off of the engine. The original generator is below the coils and alternator. A coil had failed, and the replacement was blue, I had not painted it yet. 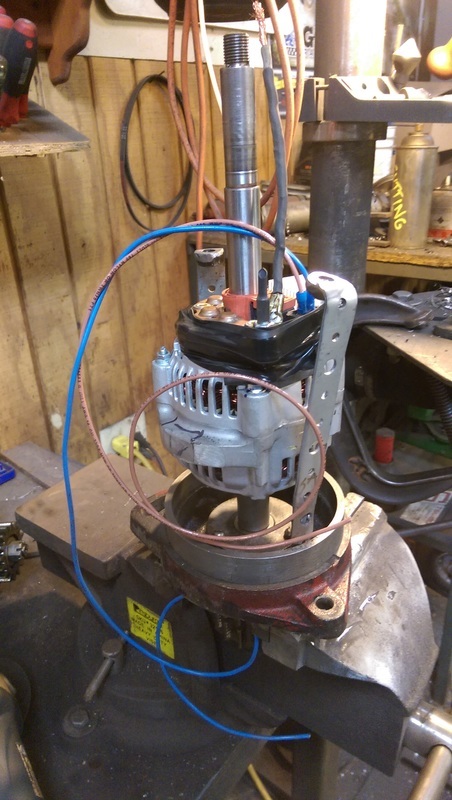 Here are some photos as I convert a compact tractor type of Alternator to be hidden in my original generator case. A cute little guy, 65$ from Ebay delivered. will need a bit of trimming. Laying it out. I bought a new piece of tubing for the case. 5 inch O.D., .125 wall thickness. I made a new input shaft, drilled and tapped for the 14mm threads on the alternators stock shaft where a nut had originallyheld on the pulley. Rear end of the alternator, I am going to drill and tap the center of this for my output (distributor) stub shaft, It's smaller than I had hoped for. What the original generator shaft looked like. 5/32 woodruff keys! Rear bulkhead that I had to install, sorry, this is the only photo of it. The straps in the photo to the right bolt to this, this goes on top of where the wires are. Side by side. The new one is 3/4 inch longer. you can see the weld mark where the bulkhead is inside the new tubing. Here it is before I slide the tubing over it and slip the wires thru the bulkhead which holds both ends together.